New York Fashion Week, while impossibly glamorous and fabulous, is also one big stressfest for we editors. As we run from show to show, downtown to uptown and back downtown again in our too high heels in what, for some reason, always happens to be the pouring rain, we’re expected to not only get our story, but look good doing it too. Over the years I’ve cultivated a kind of mini rucksack of fail-safe products and tricks I use to take me throughout my frazzled days backstage. I’ve found that this little bag of wonders actually works well for non-Fashion Week related events too — anything that requires you to go from day to evening with little to no time to touch up your makeup. Check out my list of must-haves that keep me looking my best when I’m dashing like a crazywoman throughout the streets of Manhattan. 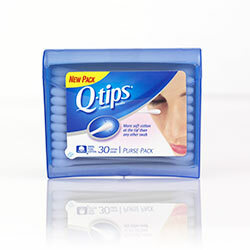 Q-Tips: I can’t stress this enough, these little babies are LIFESAVERS. I always pack a stash of them in my bag to help me get rid of mascara smudges and to use as a touch-up tool for my concealer and liner reapplications. Brown Eyeshadow: When I apply my makeup in the morning, it’s usually the makeup I’ll be sporting all day, from the 8 A.M. show to the 10 P.M. after-party. It looks a little odd to be wandering around the Tents at the crack of dawn wearing a full-on smoky eye, so I’ve taken to using medium toned brown shadows instead. The effect is a lot less harsh in the morning and I can pack a deep chocolate cream shadow in my bag to layer on at night and create a rich and smudgy look. 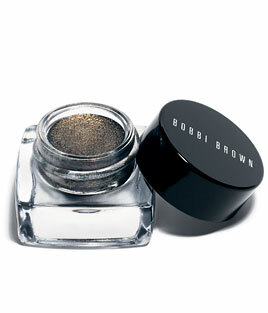 Right now I’m loving the combo of wearing Bobbi Brown Metallic Eye Shadow in Burnt Sugar washed across my lids during the day and then layering Bobbi Brown Long-Wear Metallic Cream Shadow in Antique Gold over top of it at night. Dry Shampoo: My hair has a tendency to do its own thing, regardless of how much time I spend trying to tame it in the morning. Couple that with the steady drizzle we’re supposed to be getting in NYC over the next few days and I’m looking at some pretty horrific hair. Thankfully, I’ve discovered that dry shampoo is a great way to mask hair that won’t behave — I just shake some in, muss my hair up and it gives me this cool bedhead texture and volume that looks good and is easier to manage than a sleek and polished ‘do. Tinted Lip Balm: I love the look of a bold dark lip, but its just too high maintenance when you’re going non-stop. I don’t have the time to constantly check my lips and then reapply my lipstick. In the past I’ve opted for stains, but unfortunately my lips are really dry and I kept ending up with flakes and dry patches — not very pretty. Tinted lip balms are a great way to keep lips hydrated and still get that slightly flushed look. 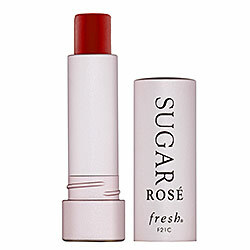 Right now I’m obsessed with Fresh Sugar Ros Tinted Lip Treatment because it makes my flake-prone lips super soft and gives them a gorgeous rosy tint that looks great with literally everything. If I’m in a pinch and looking a bit blah, I’ll also use it to add a little flush to my cheeks by dabbing a bit on my cheekbones and blending it in like a cream blush. It’s a quick and easy pick me up! Those are my tricks for staying gorgeous on the go, what are some of yours?